Did you know? 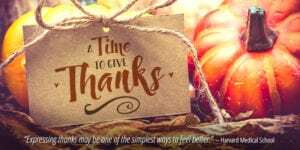 Giving Thanks is Good for Your Health! Thanksgiving is that special time when people are busy preparing meals and planning to see family and friends. Whether you’re hosting, traveling or dining out for the holiday, it’s never too early or too late to be thankful. Plus, research has shown a link between being thankful and health benefits! Check out these 10 Reasons Why Gratitude is Healthy.